On "Hinterland", protagonist and sound artist Aperus (Remanence's Brian McWilliams) continues to explore the area beyond the visible and the known. Using the ancient ruins of Chaco Canyon as the backdrop and numinous inspiration, the cover photo captures the essence of the album perfectly. In Aperus' world, Pueblo Bonito is distorted with yellow light bleeding onto the image - just like the seven compositions found here. Songs such as "Magnetism", "Earth & Clay" and "Echo Canyon" take root in melodic form (a piano arpeggio, bass figure or shifting chord progression) only to be colored and transformed by infinitely looping machines, analog synths and purposeful reprocessing. Once again, the sound runs deep as Aperus coaxes a wide range of emotions from these swirling compositional structures. The sonorous currents drift by as distorted yellows linger on the edges and play in the imagination. This is music to be felt and experienced. If you're open to its many invitations, "Hinterland" may just transport you back to the deep, resonant landscape. 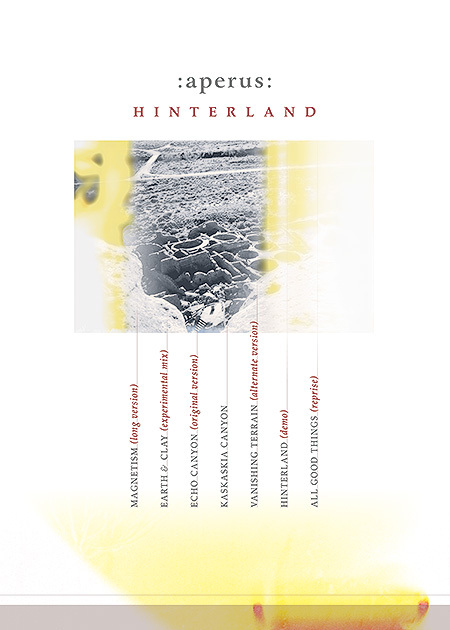 "Hinterland" gathers alternate mixes, demos and outtakes from "Tumbleweed Obfuscated by Camera Failure" and presents them in a different context. On this remastered edition, Aperus returns to the archive to produce new versions of most tracks and adds essential bonus material not found on the first pressing. As a companion and addendum, "Hinterland" offers another look back at an important period in the artist's development and completes the cycle which began on "Tumbleweed Obfuscated by Camera Failure". This 2016 remastered edition is assembled by hand and ships in a 5 x 7 cello sleeve with a striking double sided gatefold cover and six 4 x 6 photos taken by the artist at Chaco Canyon, New Mexico. John Phipps ~ keyboard and guitar on "Echo Canyon"
All songs written and produced by Brian McWilliams at The Sound Observatory 2003 - 2004. Field recordings made at Starved Rock State Park, Illinois, Spring 2003. "Magnetism" edited and remastered February 2004. All other tracks edited and remastered summer 2013 and 2015. Alternate versions of "Magnetism", "Earth & Clay", "Echo Canyon", "Vanishing Terrain" and "All Good Things" appear on the album Tumbleweed Obfuscated by Camera Failure. "Kaskaskia Canyon" and "Hinterland" are unique to this collection.